Regardless of whether your Miniature Schnauzer will be groomed for the show ring or as the family pet, the most important thing is that it is part of a scheduled routine and that your Schnauzer cooperates and enjoys it. This can be achieved by beginning grooming your dog right away, always using the proper equipment and supplies, and having a good, confident attitude when handling your dog. If you have a puppy, even though it may not need clipping right away, it's a good idea to brush him out. And when doing so, have the electric clippers near by and turn them on to get him used to the sound. Also choose a place in your home that will be designated for grooming your Schnauzer. Whether that will be on a grooming table or the bathroom counter, and keep all your supplies together and ready-to-go. 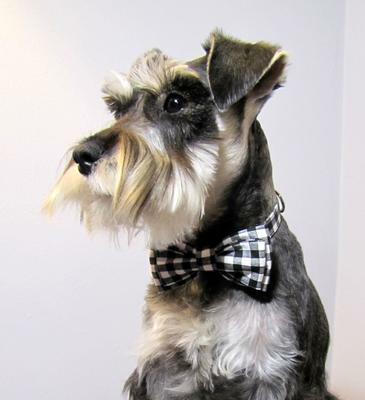 When you maintain your Schnauzer's appearance by grooming him regularly he will always look his best and feel his best. It is good practice to have your dog first aid kit handy in case you need any styptic powder or swabs to stop minor bleeding when clipping the nails. As mentioned before, if you plan on grooming your Schnauzer at-home yourself, it's important to find a place where both of you will be comfortable. And if you plan on placing your dog on a table make sure it is sturdy and be sure to use a no-slip pad. Your Schnauzer will accept the entire process more readily if he feels safe and secure. Select a gentle and natural dog shampoo which is better for your Schnauzer's coat. And these at-home dog tear stain remedies will help those of you who are struggling with ugly brown staining under your dog's eyes. When it comes to electric clippers you'll find many different styles and price points to choose from. Try and buy a really good pair of electric clippers. A bit more costly up front, but you'll save money in the long run. If you can afford it, the Andis Professional Clipper is a good model to use on Schnauzers. Schnauzer Grooming Tip: The size of the blade will indicate the how close the cut will be. Using a blade with a high number will result in a closer cut & a lower number blade will leave the hair longer. Check with the manufacturer. The easy way to trim your Schnauzer at home and achieve great results! The Andis Power Trim Cordless Trimmer includes all of the tools you need to touch-up your dog at home. This quiet, heavy-duty, motor-driven rechargeable trimmer includes stainless-steel blades for precise trimming with 4000 spm blade speed. Plus, the ergonomic shape makes it easy to use. The Andis trimmer is ideal for touch-ups around face, ears, feet and tail. Includes: Trimmer, 4 attachment combs: 1/16", 1/8", 1/4" and 3/8", and charging stand with ready indicator light.UL listed for increased safety. And for even more information, check out the FREE Online Course offered by Train Pet Dog that's used by dog groomers across the country. Whether you've decided to take your Miniature Schnauzer to a professional dog groomer or groom your Schnauzer at home, you will need to have some basic dog grooming supplies on hand in order to keep your Miniature Schnauzer's look during those in-between trimmings and salon visits. * And Watch the Schnauzer Grooming Video! "Knowledge Share"... 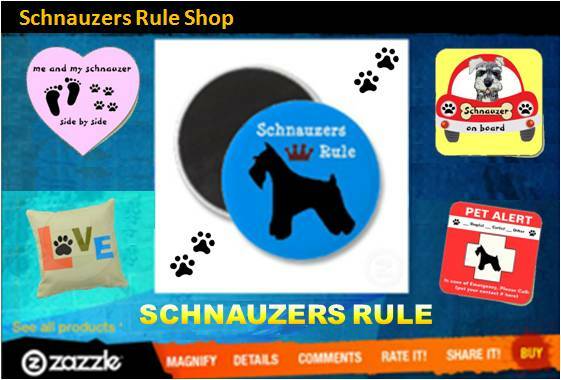 If you found this page on Miniature Schnauzer Grooming helpful and informative, please share it with your dog-loving friends by clicking on one of the share links (like facebook, twitter, and google +1) located at the top right or bottom of this page. You Can Do It Dog Grooming - an educational site containing information on dog grooming, dog grooming equipment, dog supplies and much more. Mini Schnauzer Total Care Guide w/FREE DVD on training, diet, grooming, and health care.